New – Fluke 787B ProcessMeter™. 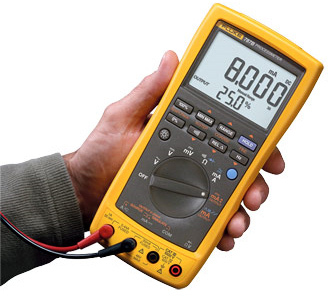 The Fluke 787B ProcessMeter™ doubles troubleshooting capabilities by combining the power of a safety rated digital multimeter and mA loop calibrator into a single, compact test tool. Based on the trusted measurement capabilities of the Fluke 87 DMM, the 787B adds the ability to measure, source and simulate mA with the accuracy and resolution you would expect from a Fluke mA loop calibrator, giving you the ideal tool for troubleshooting and calibrating current loop applications. With Fluke Connect® mobile app and desktop software compatibility technicians can wirelessly monitor, log, and share data from the field with their team anytime, from anywhere*. *Requires Fluke IR3000FC module (not included). Not all models are available in all countries. Check with your local Fluke representative.